If your home remodeling dream includes making the most of your outdoor living spaces, an outdoor kitchen can be a great place to start. Whether you build an extravagant kitchen that’s on par with your indoor kitchen or want more basic outdoor cooking capabilities, there are several aspects to consider as you’re planning. Where you decide to locate your outdoor kitchen can lead to a number of other considerations. Is the ground sloped or uneven? If so, you may need to have soil removed or relocated, or need retaining walls built to contain the soil. Determining the best way to handle an uneven site could require the advice and assistance of a building expert. 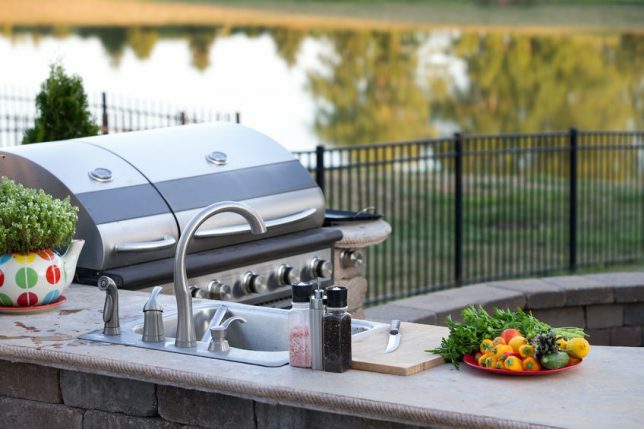 Proximity to electric, gas and water lines are also key when choosing the best location for your outdoor kitchen. Your choice of materials and appliances will likely depend upon your climate. Select appliances and materials that can withstand extreme temperatures if you live in either a very warm or cold climate, or those that can handle high amounts of precipitation if you reside in a wetter region. And speaking of precipitation, resistance to water is an important consideration for any outdoor kitchen, regardless of your location. You’ll want your foundation and flooring to be able to handle some weather, as well as being durable and strong enough to bear the weight of your appliances. Choosing low-maintenance designs and materials will go a long way toward keeping your outdoor kitchen looking great without the need for frequent sealing or painting. Consider durable stone veneer, which is relatively lightweight but optimally sturdy as one option for your building material. Concrete countertops are another attractive, easy-to-maintain element that’s tough and long-lived. Granite, tile and stucco are also solid choices for materials. Cooking safety is another important concern when constructing an outdoor kitchen. If you want to run a gas line to your grill or stove top, be sure to plan for proper venting to keep the gas away from your cooking space. You’ll also want to make sure you install an emergency gas shut-off system. Always be sure you’re adhering to local codes when you construct your outdoor cooking experience, as they’re designed to help maximize safety. Check with your local building code authority for information on building and fire codes for outdoor kitchens. And be sure your contractor is up to speed on all necessary code requirements. A small outdoor kitchen may be a DIY project depending upon your skills, but for the best results on higher-end kitchens, working with a qualified contractor can actually save you time and money in the long run. At Contractor Connection, every contractor in our network has already been vetted and has the proper licensing, insurance and experience to do the job right. For a free, no-obligation estimate, simply enter your ZIP code above and you’ll hear from a pre-qualified contractor soon.